"If what U.S. Steel wants to do is OK, something's seriously wrong with this country," said Local 1005 President Rolf Gerstenberger. U.S. Steel is trying to drive a wedge between generations, locking out steelworkers in Hamilton, Ontario, when union negotiators would not take a deal that sold out past and future workers. Steelworkers Local 1005 refused to bring a contract back to its 900 members that would have ended cost-of-living increases for 9,000 pensioners and dumped future workers into a shaky 401(k)-style retirement plan. Current workers, meanwhile, were presented with a deal that would weaken their supplemental unemployment benefit, a key to survival for workers who have been idled for much of the last two years as steel demand dwindled. At the last minute the company backed down on concessions aimed at current workers, trying to convince them to forget about others. U.S. Steel is attempting to make coke—but not steel—with salaried employees. Before he was locked out, Brian Walpac spent a few days training a 20-something accountant to run his three-story-tall coke-oven machine. The office worker was shaking with fear. "Seeing the hot coke come out of the oven looks like a version of hell to most people," acknowledged Walpac. Salaried workers are locked inside the plant, sleeping on cots. They won’t be allowed out for weeks. Walpac is confident some won’t come back, and production will continue to suffer. That could give the union the upper hand—if members can hang together long enough to wear the company down. A generational gap caused by years of little hiring is chafing at union solidarity. About half the workforce is over 50, and about another third is under 40. Many of the younger workers came into the plant in recent years as the company prepared for a wave of retirements. "For some of the young guys, getting into the plant is a rare chance to have a decent job after years of barely holding it together with temp work," said Don Wells, who teaches labor studies at Hamilton’s McMaster University. Members report a generational divide, with some younger workers vocally urging the union to let them vote and take whatever they can get. Older workers remind them that decades of struggle created the standards they enjoy. "I think everyone’s underestimating this younger generation,” said Jake Lombardo, a 33-year vet. "Lots of them are kids of the last generation, and they’re pissed." Under provincial law, the employer can force a membership vote on its contract offer once during a bargaining round. Most of these compelled votes are defeated, and U.S. Steel hasn’t submitted its proposal yet, perhaps wagering that its offer to leave current workers unscathed will force the union leadership’s hand as the lockout drags into a long winter. "They’re using psychological tactics," Walpac said, “and people are realizing what deviousness they’re up against." Local 1005 President Rolf Gerstenberger said the union saw the confrontation coming years ago, and has been holding weekly meetings that drew about 150 workers to trade information and strategize. Weekly leaflets in downtown Hamilton got the union’s position out to the community well ahead of the lockout, he added. 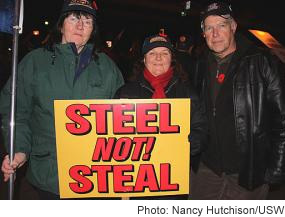 The union is facing an uphill climb: its sister U.S. Steel local in Nanticoke, Ontario, took an eight-month lockout last year before giving in to the two-tier pension. And Steelworkers at the Vale Inco mines in Ontario gave up defined-benefit pensions for new hires in July to settle a year-long strike. "The difference between us and anybody else is that we started two years ago preparing," Gerstenberger said. "People know that if what U.S. Steel wants to do is OK, something’s seriously wrong with this country." The Steelworkers point to promises U.S. Steel made when it took over the two plants in 2007, which included guarantees to employ 3,000 workers and meet production benchmarks. The company broke its promises, idling the plants and locking Nanticoke workers out, claiming the recession forced shutdowns. The federal government sued early this year, and courts could yet impose $10,000-a-day fines. "They had contractual agreements and they ignored them," Walpac said. "I can’t pull that with my landlord—hey, there’s a recession on, I’m not paying rent." Other U.S. Steel locals are watching the lockout carefully: Local 1299 President Marc Barragan at the Detroit-area Great Lakes Works said members will join the lines in Hamilton, and pledged an all-out fight if the company tries to extend its attack on defined-benefit pensions south of the border. The Hamilton plant’s winning strike in 1946 was a crucial CIO victory that propelled the Steelworkers toward industry-wide pattern bargaining. But as the city’s manufacturing core has been eaten away over decades, city leaders have refashioned it in Pittsburgh’s image—emphasizing the "knowledge economy" of hospitals, universities, and public employment. The Hamilton works have withered from 25,000 steelworkers in 1980 to less than 1,000 today. U.S. Steel doesn’t process the slabs it makes in Hamilton, having closed the mills there. Slabs are sent to the U.S., a costly journey—though none are currently being shipped. The plant’s survivors remain determined to see through the company’s song and dance and pass along what generations have built. "The union has fought for everything we’ve got and I’m not about to turn my back on them now," said Ken Smith, a 30-year veteran. Vote NDP in Ontario – but build an Independent Alternative! Defend the Portland Hotel Society! Where's the Democracy in the Environmental Movement? What caused the oil train disaster? The NDP, poised for power but to what effect? Is there any way out of the Greek crisis? Are We Really Living in a "New Saskatchewan"? Another Vancouver Riot: Class Rage or Road Rage? Postal Workers: Retreat or Occupy? Which Way Forward for the University of Toronto General Assembly? Election 2011: More of the Same, Turning Point, Transformative Opportunity? Libya: No Foreign Intervention - How Can We Aid Libya’s Freedom Movement? Should Ontario Workers Pay for the Deficit? No, It’s the class struggle, stupid! Good News - Gordon Campbell Quits! Charter 2008: China's Path to Freedom? Quebec Solidaire: Towards an Anti-Capitalist Party? Afghanistan: Troops Out - Peace Now!